Our rates on our RESERVATIONS PAGE are very competitive and our service is top notch. We can accommodate up to 7 guests on board at a time. Whether you charter our yacht for fun, for relaxing or simply to stop at one of your favorite dockside restaurants we are here at your disposal during your stay at Grand Cayman for as many days you want! Your captain and your yacht awaits your command! All you need to bring is a towel and your smile! 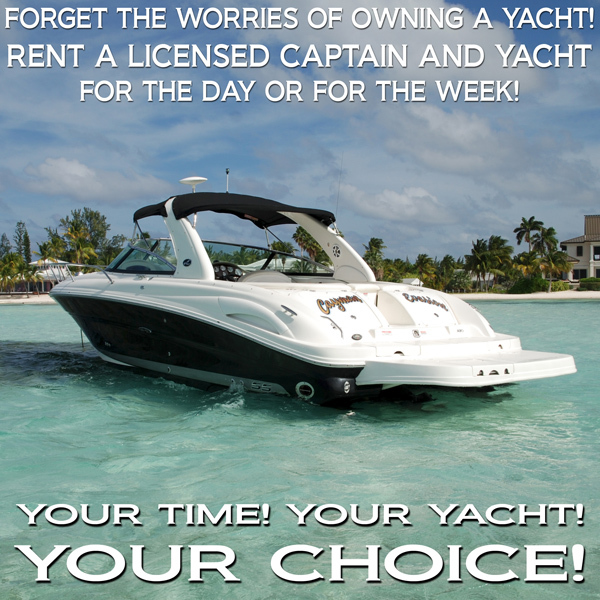 SELL YOUR YACHT AND RENT OUR CAPTAIN AND YACHT! Enjoy being out on our blue ocean and play with our Southern Stingrays in 3 feet of water on a natural sandbar. Our talented staff can help you touch, feed, hold, swim or even kiss our friendly stingrays! Snorkel one of our famous North Sound reefs and visit Starfish Point and relax on a white sand beach and pick up starfish that “hang out” by this tranquil area or stop by one of the many dock access restaurants in the sound and enjoy some of the local foods and drinks. Having family around and each one wants to do things on their own time? Call us! we can maintain your daily rental schedule. Should your in laws want to be dropped off at a restaurant then go shopping? let us be their transfer! Your kids want to have fun at the sandbar or stop at one of the dock access restaurants? Step on board, we are there all day for you! There are so many things to do, so why bother with a trailer to launch or load your yacht, or with the maintenance bill to keep your yacht running! Just call us! we will be there with your own Captain and yacht! For birthdays or special days, we can also provide a professional photographer to capture those special moments! Just let us know and we will have one on board capturing your special day!